…even though I’m missing an event that I, as a knitter, was born to attend. More specfically, a sock knitter. You all know my love, my passion for socks. It’s all about the process. I could care less about wearing them. And I have alot to wear. 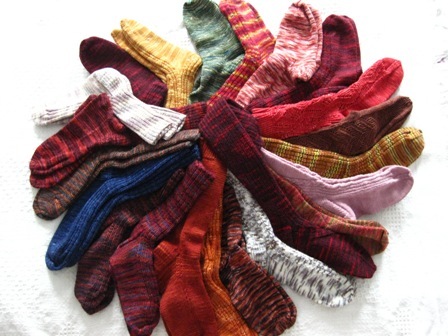 To save you some time, that’s 22 pairs (not to mention all the ones I’ve given away over the years). The Sock Summit 2009 kicks off in Portland, OR today. To all those attending, have an awesome time. I’ll be knitting, socks of course, and trying not to be too jealous. on August 6, 2009 at 3:28 pm | Reply Kim D.
You are a better person than I am. I’m completely jealous, but also working on a pair of socks today from Sock Innovations. Oh, you were so meant to be there. I’ve thought of you everytime I’ve read a Harlot post about it. Next year, next year. In the meantime, cast on a paper of booties. I hope they do this again next year! I can tell you that it’s an absolute delight. The grins on all the faces are telling! Aw, I wish you were here! I ran into Therese from Camp yesterday in the marketplace (I really hope we can all make it back to Camp again together some year) and it made me think of you, too. How about you email me your address and I’ll send you a souvenir?